After my long drawn out saga with Talktalk for 6 months where they proved to be as useful as a chocolate fire guard, I have bit the bullet and decided to move over to AA. In fact, at this moment it os only because of the help of AA support that I am even in the position to enjoy the upcoming FTTC service I hope to get! Welcome to A&A! If you don't use the phone line for outgoing calls, then moving that to us may save a few pounds - just a thought. Let us know if you need more info though. Hi Paul Ive also bit the bullet and I am now with A&A the support and banter is brill and the control panel is mind blowing! HI Paul so you should have been installed by now - how is it? I am loving the whole experience with A&A so far. Install tomorrow, between 8am -1pm. Looking forward to it. Hope your happy with your connection. A&A appear to be a very good choice for those super light bandwidth home users, or businesses who want added reliability. I average around 300-400GB per month, which would end up costing me £150-200 on A&A, thanks but no thanks! 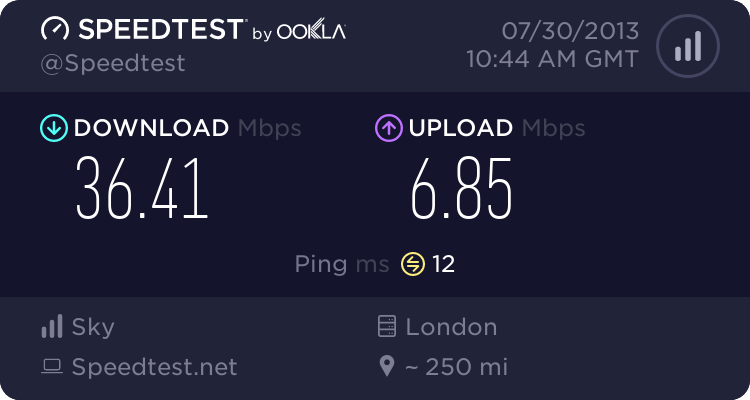 I chose Sky FTTC (£20/month) for a completely unlimited connection, and I'm able to max out my line any time of the day. Install went in at 8am this morning. A quick reconfigure of my Apple Airport Extreme and wham!! Delighted! I am sure it will even out over the next few days. Am I likely to see a fall or an increase? I wouldn't call my usage super lightweight. I signed up for 200gb per month at £45. As Andrew says above, its £55 for 300gb. You must be looking at the old tariffs.